EU member states have concluded an agreement that renewable energy will cover 20% of the total energy production by 2020. To achieve this target, it is essential to investigate all possibilities for renewable energy production. We investigated whether groundwater could provide a shallow geothermal energy resource, and to what extent it could meet the demands for heating buildings in Finland. Our research focused on classified aquifers, namely, groundwater areas that are zoned for urban or industrial use. The heating potential of Finnish aquifers was estimated based on the flux, temperature and heat capacity of groundwater and the efficiency of heat pumps. The design power of residential buildings was then simulated. 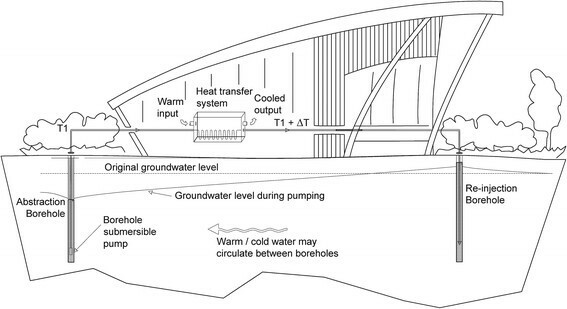 Finally, the design power was divided by the groundwater power to determine the ability of groundwater to heat buildings. Approximately 56,500 ha of Finnish aquifers are zoned for urban or industrial land use. These aquifers contain 40 to 45 MW of power. In total, 55 to 60 MW of the heat load could be utilised with heat pumps, meaning that 25% to 40% of annually constructed residential buildings could be heated utilising groundwater in Finland. There are several hundred sites in Finland where groundwater could be used for energy utilisation, and groundwater could thus be a significant source of local renewable energy. However, because of geological and geographical factors, groundwater cannot be considered as a nationwide energy source. Future research should define the area-specific limiting factors for groundwater energy use. EU member states are committed to promoting the use of renewable energy sources (RES) by accepting the EU directive 2009-28-EN. In Europe, the share of RES systems should reach 20% by the year 2020. One form of RES is groundwater, which can be exploited to supply the heating and/or cooling demands of residential households or industries. Hence, groundwater is not only a source of individual or municipal drinking water but also a resource for renewable energy production. The low enthalpy energy in shallow aquifers, typically below 100 m in depth, indicates an energy resource in which the temperature is below 30°C (Allen and Milenic ; Banks ). This geothermal energy is mostly derived from solar radiation (Fetter ), as only a minor proportion of stored energy in shallow aquifers originates from the Earth's internal heat or from heat produced by plate tectonics (Banks ). Several studies have demonstrated that shallow aquifers under cities can be a significant low enthalpy energy source (Allen et al. ; Kerl et al. ; Zhu et al. ). The Netherlands is an example of a country with widespread groundwater energy utilisation, where over 3,000 heat pumps were in use, and over 200 million m3 of water was pumped for energy utilisation in 2010 (Statistics Netherlands ). Two good examples of groundwater utilisation in Nordic countries are Gardermoen airport in Oslo, Norway, and Arlanda airport in Stockholm, Sweden. Both airports are located on a glaciofluvial gravel and sand deposit: Gardermoen is operating with a maximum groundwater capacity of 20 to 25 m3/h (Eggen and Vangsnes ), and Arlanda with a capacity of 720 m3/h (Persson ). A demonstration heating plant, with a heat pump capacity of 72 m3/h groundwater, was also built in Forssa, southern Finland, in 1984 to 1985 (Iihola et al. ). The technique for groundwater energy utilisation is designated as an open system or open-loop system. In an open-loop system, groundwater is circulated between two or more groundwater wells, and energy is extracted from the flowing water by a heat transfer system (Bonte et al. ; Haehlein et al. ). If the heating energy is produced by a heat pump, the term groundwater heat pump (GWHP) system is also used (Haehlein et al. ). Most typically, groundwater is pumped from springs, wells, boreholes or flooded mines to GWHP systems. The principle of a double-well GWHP system is illustrated in Figure 1. Schematic representation of a GWHP thermogeological system. Groundwater at a certain temperature T 1 is pumped from an abstraction well or borehole, then led to a heat transfer unit to extract the energy, and finally re-injected back into the aquifer via an injection well. An equivalent amount of groundwater is re-injected into the aquifer to that pumped out of it; only the groundwater temperature changes by the factor ΔT (figure courtesy of Golder Associates (UK) Ltd.). GWHP systems require a particular environment to work properly. The main requirements are soil and rock that possess a relatively high water conductivity of 10−5 to 10−1 m/s and a suitable chemical composition of groundwater (Sanner ). A high hydraulic conductivity of the soil or rock allows sustainable groundwater circulation (Kalf and Woolley ; Zhou ), so that the abstraction and re-injection of groundwater has a minimal local effect on groundwater storage, whilst suitable chemical properties of the groundwater, i.e. relatively low concentrations of iron (Fe), manganese (Mn), carbon dioxide (CO2) and chloride (Cl−), are essential to avoid clogging and corrosion of the GWHP system (Lindblad-Påsse ; Sanner ). An inadequate design or unfavourable environmental conditions may allow excessive groundwater flow from the injection well to the abstraction well, and hence may reduce the efficiency of the GWHP system. Especially in the Nordic region, the implementation of groundwater as a source of heating energy can also fail due to the low natural temperature of groundwater. Finland is one of the world's leading users of RES. In 2010, RES supplied 30.2% of the final consumption of energy (Statistics Finland ), whilst the target share of RES in the gross final energy consumption of Finland in 2020 has been set at 38% by EU directive 2009-28-EN. The objective of the National Energy and Climate Strategy is to increase the use of renewable energy sources and their share of total energy consumption (Ministry of Employment and the Economy ). In 2011, approximately 8% of the energy for heating buildings, 3 to 4 TWh, was produced by air, air-water and ground source heat pumps (Statistics Finland ), but it is estimated that the use of heat pump energy should double from current levels by the end of 2020 (Ministry of Employment and the Economy ). Ground source heat pumps accounted for approximately 40% of the total heat production by heat pumps in 2011 (Statistics Finland ). Groundwater use for energy production in Finland is controlled by the Water Act and the Environmental Protection Act. However, there are no national regulations concerning the temperature threshold limits, unlike, for example, in Austria and Germany, where a temperature difference of 6 K has been set as the groundwater threshold limit for open-loop systems (Haehlein et al. ). If the benefits of groundwater utilisation are greater than the disadvantages, the application for a permit for groundwater utilisation will be approved according to Finnish legislation (Water Act ). In order to achieve the RES targets by the year 2020, it is necessary to recognise all potential renewable energy resources in EU member states. Despite the favourable legislation, which does not pose significant obstacles to groundwater pumping, as well as the GWHP experiment in the 1980s (Iihola et al. ), GWHP systems are not widely recognised as an option for RES in Finland. In this study, we explored how significant a heating energy resource groundwater could be in Finland. We measured three parameters that describe the heating potential of aquifers: (1) the potential heat power capacity that Finnish aquifers under urban or industrial land use can produce, (2) the amount of heating power that can be delivered to heat distribution systems of buildings from such aquifers by utilising heat pumps and (3) the surface area (m2) of detached houses and apartment buildings that could be heated using groundwater heating power. The Precambrian bedrock of Finland is covered by a continuous, thin layer of glacial and postglacial sediment deposited during the Weichselian glacial stage and the Holocene, varying in thickness from a few metres to some tens of metres (Lahermo et al. ; Lunkka et al. ; Saarnisto and Salonen ). The lowermost sediment units consist of till. However, the main aquifers in Finland are found in glaciofluvial sand and gravel deposits, i.e. eskers or ice-marginal end moraine complexes, the most extensive of which are the Salpausselkä end moraines. Aquifers are normally unconfined, but semi-confined or confined aquifers also exist, because clay deposits in glaciolacustrine lakes or the Baltic Sea often cover the surface of the terrain in southern parts of Finland. The hydraulic conductivity of Finnish glaciofluvial sand/gravel aquifers is high, normally between 10−5 and 10−2 m/s (Salonen et al. ; Salonen et al. ), which allows a relatively high groundwater abstraction and injection rate. Finland has 5,957 categorised aquifers, referred to as groundwater areas, with hydrogeological information on these being stored in the publically accessible Hertta Database (Britschgi et al. ; The Hertta Database ). The estimated natural recharge of Finnish groundwater areas is approximately 5.4 million m3 of water per day (The Hertta Database ). Although in some cases, an entire aquifer is not recognised as a groundwater area, it may include local groundwater supply wells that can be classified as point-sized groundwater areas (Britschgi et al. ). Areal information on point-sized aquifers is provided in a spot-like form, with an area of 0 m2, in The Hertta Database (). The data used in this investigation also include point-sized groundwater areas. The reported mean groundwater temperature in Finland varies from 3.5°C to 6.6°C (Mälkki and Soveri ; Oikari ), being higher in southern Finland and lower in northern Finland. Hence, this paper considers a low enthalpy groundwater resource with a temperature of under 10°C. In general, groundwater quality is suitable for GWHP systems in Finnish aquifers, although the chemical composition of groundwater varies between different parts of the country. High Fe, Mn and/or Cl− concentrations exist in confined aquifers of coastal areas, where clay deposits overlay sand or gravel units (Korkka-Niemi ; Lahermo et al. ). Each of the classified aquifers with its land use data was analysed, totalling 5,957 groundwater areas. Groundwater data were collected from The Hertta Database (), and land use data from the Corine 2006 Database (). Both databases are managed by the Finnish Environment Institute. The 15 Centres for Economic Development, Transport and the Environment (ELY) are responsible for the control, protection and monitoring of groundwater areas and hence deliver hydrological information to the Hertta Database. The land use categories in The Corine 2006 Database () were created according town planning information, which allowed us to divide the land use in the aquifer areas into urban or industrial. A novel groundwater energy database, combining the groundwater area and land use information, was created using the ArcGis 10 software. The data from Hertta and Corine databases was supplemented with 15 personal enquiries and interviews, including one person from each ELY Centre, during the process. If the Hertta Database did not have a recharge value for a particular aquifer, it was estimated based on the interviews or on pumping information from water intake plants. Only point-sized groundwater areas with an estimated yield of 100 m3/day or more, which were zoned for urban and/or industrial land use, were selected for our study. These areas were manually added to the groundwater energy database. To document the amount of groundwater available for energy production, we estimated the groundwater flux of each aquifer, namely, the groundwater area. As the groundwater abstraction and injection rates are equal during energy utilisation, the natural recharge value is used for the value of the groundwater flux. Aquifers are often zoned for partly urban or industrial land, and partly outside of these land use forms, especially when the aquifer area is large. To estimate the groundwater flux of a portion of an aquifer, the aquifer's proportional land use ratio is calculated (see Figure 2). For example, the total size of the Kylmäkoski aquifer in the municipality of Akaa is 84.34 ha, and the total recharge is 348 m3/day (The Hertta Database ). The area under urban land use is 15.48 ha (18.36%) of the Kylmäkoski aquifer (The Corine Database ). In this study, the estimated groundwater flux of 63.89 m3/day (18.36% × 348 m3/day) was used as the amount of groundwater that can be circulated from Kylmäkoski aquifer. 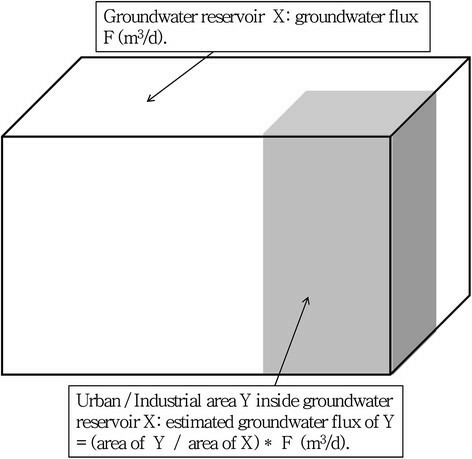 Method for calculating the estimated groundwater flux. An aquifer (area X) is partly under urban or industrial use (shaded grey, area Y). The groundwater flux from area Y differs from the entire aquifer's (X) flux. The estimated flux of area Y is calculated by multiplying the proportional land use by the aquifer's recharge. Energy calculations were performed in three phases. Firstly, heat power extractable from the groundwater flow (amount of heat, G) was calculated to describe the potential groundwater heating capacity of Finland. The amount of heat power transportable to a space-heating unit using GWHP systems (total heat load, H) was then calculated. Thirdly, we calculated an approximation of the equivalent area (m2) of residential buildings that could be heated using groundwater heating power. Calculations were performed for each mapped urban and industrial area located inside a groundwater area. (Allen et al. ; Allen and Milenic ; Banks ). The estimated groundwater flux (see Figure 2) is used as a value of F, and 3 K as a ΔT value. The value of 4,200 J/kg · K is used as the heat capacity of water. The current value is the heat capacity of water at a temperature of 5°C (Yaws ). (Allen et al. ; Allen & Milenic ; Banks ). Equation 7 was used to calculate the heat load in this research. Based on the information provided by Bayer et al. (), EHPA () and Saner et al. (), a COP of 3.5 was used. The design power (W/m2) of detached houses and apartment buildings was simulated with the IDA Indoor Climate and Energy (IDA-ICE) 4.1 dynamic simulation tool. 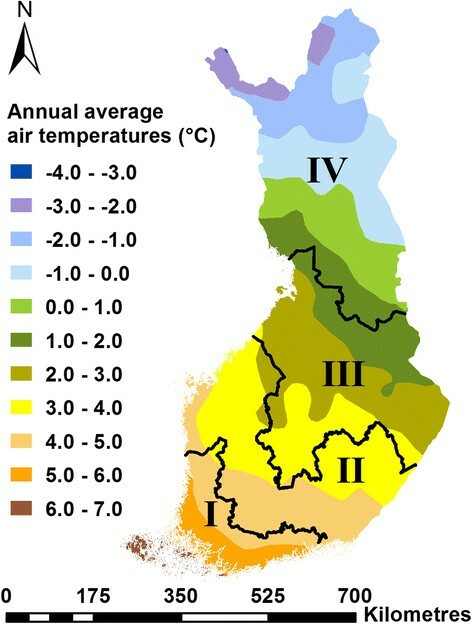 The heat demands of different locations were simulated based on the four climatic zones in Finland (Figure 3). Finland is divided into four climatic zones to examine the energy consumption of buildings (National Building Code of Finland ). The definition of these climatic zones is mainly based on 30 years of data on annual average air temperatures from representative meteorological stations for each climatic zone (Kalamees et al. ). To estimate the surface area of detached houses or apartment buildings that could be heated with power provided by groundwater, the calculated heat load (H) was divided by the design power. The climatic zones (I to IV) and annual average air temperatures in Finland from 1980 to 2009. Reprinted from Kalamees et al. (), with permission from Elsevier. The groundwater energy database includes 801 groundwater areas, comprising 700 urban and 169 industrial areas. The database indicates that 56,464 ha of Finnish groundwater areas are under urban or industrial land use, and the theoretical groundwater flux of these exploitable areas is 293,291 m3/day (Table 1). Table 1 provides summary information on the exploitable groundwater reservoirs, and the exploitable area and percentage of the aquifers zoned for industrial and/or urban areas. A recharge value in the Hertta Database is calculated based on assumptions that precipitation, the hydrological cycle and porosity of soil are constant over the entire aquifer (The Hertta Database ). However, in shallow Quaternary aquifers, soil and hydrogeological conditions are not constant; for example, the thickness and foliation of soil layers vary in each aquifer, which cause differences in groundwater flow velocity, direction and percolation. The assumption of constant meteorological and geological conditions in the Hertta Database is the largest source of error in our research, as it affects the utilisable amount of groundwater, which has a direct influence on the amount of heat and the heat load results. As can be noted from Equations 1 and 7, a 10% error in the F value will create a 10% error in the G and H values. However, the Hertta Database is the only nationwide database that includes groundwater recharge values, and hence, it was used in this research. Because of high hydraulic conductivity of Finnish aquifers, it is common to have the Water Rights Court permission to pump 400 to 1,500 m3 groundwater/day from one well (The Hertta Database ). In Sweden, in Arlanda airport which is located on a glaciofluvial esker, it is possible to pump 1,570 m3/day from one well (Persson ). High hydraulic conductivity allows also efficient water injection back to the aquifer. The average groundwater flux in our data is 303 m3/day (Table 1). Hence, well hydraulics will not cause major obstacles to groundwater energy use in Finnish aquifers. As an equal amount of groundwater is injected into the same aquifer from which it is pumped (see Figure 1), the aquifer-scale water storage budget remains constant, and the sustainable yield value equals the natural recharge value (Zhou ). We realise that groundwater utilisation will produce small-scale changes in the water budget around abstraction and injection wells. Noting the reality that Finnish sand and gravel aquifers provide hydraulic conductivity of 10−5 to 10−2 m/s (Salonen et al. ; Salonen et al. ), the buildings and hence the GWHP systems are planned to have a life cycle of 50 years to a maximum of 100 years. We investigated urban or industrial areas, where natural groundwater conditions have changed due to urbanisation, and it is reasonable to use the natural recharge value, i.e. the maximum sustainable yield (Kalf and Woolley ; Zhou ) for country-scale GWHP potential calculations. If re-injection was carried out by allowing the groundwater to infiltrate from ponds to the aquifer, evaporation in summer would reduce the amount of injected water, and the natural recharge value could not be used to a further extent. However, in ponds, the melting of snow in spring would increase the amount of injectable water. Hence, the sustainable yield estimation, especially for property-sized projects, cannot be performed without site-specific groundwater investigations. As inter alia, the socioeconomic issues need to be considered when estimating the sustainable yield (Alley and Leake ; Sophocleus and Devlin ), the possibility of mining groundwater for 50 to 100 years for renewable energy utilisation, especially in urbanised areas, may allow decision makers to accept a larger sustainable yield than the natural recharge of an aquifer. The use of groundwater is controlled and protected by law in Finland, and an environmental permit must be obtained from the Regional State Administrative Agencies to implement a GWHP system if the pumped amount of groundwater exceeds 250 m3/day (Water Act ; Environmental Protection Act ). Assuming that groundwater circulation will have no major effects on the groundwater storage, legal permission for GWHP utilisation is easily arguable. We assessed that it is more accurate to use the available recharge information approved by the Finnish Environment Institute than to try to estimate a general sustainable yield multiplier for the GWHP systems in Finland. Our study focused on the Finnish aquifers that are classified as groundwater areas by the Finnish Environment Institute, as official recharge data are only available for classified aquifers. Nevertheless, the methods used in our study are applicable to all geological or artificial deposits suitable as a source of groundwater energy. Aquifers that are not under urban or industrial land use were excluded from this investigation due to the long energy transportation distances, which makes them economically unattractive to utilise at present. Groundwater areas of the Åland Islands, Kemijärvi's Kattilanvaara (no. 12320171) and Keminmaa's Kiviharju (no. 1224102) were excluded from our research, as no publically available information on recharge exists. The area of Santahamina, Helsinki, was incorrectly designated an industrial area in the Corine 2006 Database, but was changed to an urban area for the groundwater energy database. As the Hertta and Corine databases are in vector format, aquifer borders were used as the cut-off line, and all urban and industrial areas included in the groundwater energy database are therefore situated inside aquifers. The natural groundwater temperature in Finnish aquifers is quite low, being between 3.5°C and 6.6°C (Mälkki and Soveri ; Oikari ). In northern Finland, this temperature can be less than 3.5°C. Even though groundwater may be easily utilisable in these regions, the relatively low groundwater temperature may significantly reduce the groundwater's heating potential. This study was based on natural groundwater temperatures. However, according to Allen et al. (), Ferguson and Woodbury (), Zhu et al. () and Kerl et al. (), the urban heat island effect has increased groundwater temperatures under cities. Elevated subsurface temperatures will enhance the groundwater's heating potential, and it may therefore be possible to utilise groundwater for heating even in a region where the groundwater is naturally cold. Our results demonstrate that Finnish aquifers zoned for urban or industrial land use contain 42,772 kW of heat, G. The average heat content of aquifers is 46 kW, the median being 18 kW (Figure 4). The 90th percentile value is 106 kW, which equals the 95th most potential aquifer. This means that the variability in energy potential is high, especially amongst the most potential aquifers. Hence, a box plot diagram for the 100 most potential is also presented in Figure 4. 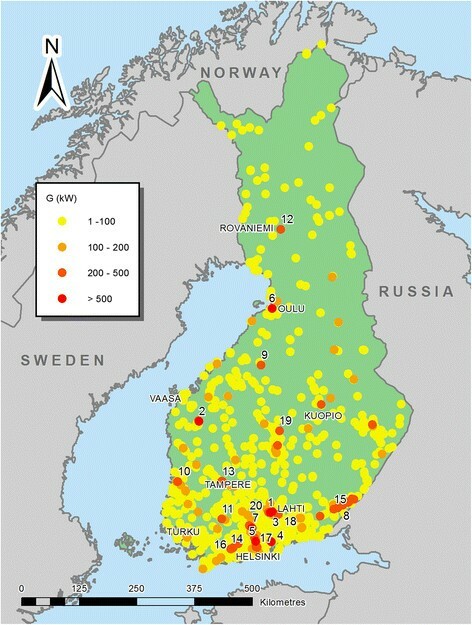 Most of the potentially utilisable groundwater energy areas are located in southern Finland (Figure 5). This distribution is due to the higher population density in southern than in northern Finland, which affects the land use and drinking water exploitation of aquifers. In Figure 5, G values are divided into four power categories: aquifers in the yellow category contain 1 to 100 kW of heating power, light orange 100 to 200 kW, dark orange 200 to 500 kW and red over 500 kW. The G values were used instead of H values in Figure 5, as H values are highly dependent on heat pump efficiency and will vary as heat pump technology develops over time. Hence, G values describe the potential heating power that could be utilised from flowing groundwater. Distribution of the calculated amount of heat ( G ). The data for all aquifers are on the left, and the 100 most potential aquifers on the right. The boxes indicate the 25th and 75th percentiles and median. Whiskers indicate the 10th percentile (lower) and 90th percentile (upper). The mean value (both diagrams) and maximum (right) are also presented. Potential aquifers for GWHP energy utilisation in Finland. Each dot represents a single aquifer. The dot colour indicates the categorised amount of heat (G). Numbers from 1 to 20 indicate the location of the 20 aquifers with the largest potential. (Basemap Database© Esri, DeLorme, Navteq and Natural Earth). The aquifer with the best potential, Lahti, has an almost 2.5 times greater heating potential than the second best, Koskenkorva (Table 2). The Lahti aquifer has been zoned for both urban and industrial land, with a total heating potential of 2,700 kW, being 36.5% of the total heating potential of the top ten aquifers in Finland. The city of Lahti is the largest city on the Salpausselkä I formation (Statistical Finland ), located on the confluence of two ancient ice lobes, the Baltic and Lake Finland ice lobes (Punkari ). Hence, large areas in urban and industrial use on the top of the most extensive aquifer explain the results from the energy potential calculations. Table 2 also presents the amount of heat extractable from 1 ha for each aquifer. As the area of point-sized groundwater areas is zero in the Hertta Database, the power/hectare value cannot be calculated for these aquifers. Differences of over tenfold exist between the top 20 aquifers in the amount of heat utilisable from 1 ha. In total, 16 of the 20 aquifers with the best potential are zoned for urban land use. The 20 areas with the largest groundwater heating energy potential, as well as the areas ranked 100th, 200th, 300th, 400th and 500th in potential. The code and name along with the land use of the groundwater area and the name of the municipality are presented. *Denotes a point-sized groundwater area. We used 3 K as the value of ΔT, because Finnish groundwater water will not usually freeze, even if 3 K is extracted. This is a conservative figure, and a higher ΔT could be used in many cases, especially in southern Finland. Noting the study of Brielmann et al. (), there appear to be no environmental barriers to 3 K groundwater energy utilisation. There is no known measured information on the COP from Finnish GWHP systems, and hence, we used a literature value for the COP. According to the literature presented by Allen et al. (), Banks (), Lund et al. () and Warren (), the COP has been between 3 and 6 for most GWHP sites. The COP value describes the efficiency of a heat pump in any given time frame. Hence, the COP in winter can vary significantly from that in summer. The efficiency of a heat pump over a year is measured by the seasonal performance factor (SPF). The SPF is highly dependent on site characteristics such as the geology, climate and geothermal gradient (Bayer et al. ), which vary significantly between the areas of Finland. The total energy efficiency of heating systems, not just the heat pump consumption, can be described by the system seasonal performance factor (SSPF) (Banks ). Saner et al. () proposed an average SPF of 3.5 for heat pumps. EHPA () suggests an SPF value of 3.2 for Scandinavia. As heat pump technology has evolved during recent decades, the SPF ratio has continuously improved (Bayer et al. ), and hence, we used a COP of 3.5. The COP is preferred in this article, as the calculations are not site or system specific, and neither the SPF nor the SSPF can therefore be measured. To calculate the area (m2) of buildings that could be heated using groundwater energy, the quantity of heating energy, i.e. the design power, has to be known. The design principles and results of the IDA-ICE 4.1 simulations are presented in Table 3. The minimum outside temperature presented in Table 3 represents the climate that the designer should use in energy calculations to achieve the minimum energy performance requirements of buildings (Kalamees et al. ). Three different building classes, defined by the construction method and time, were simulated. The simulation results indicated that 20% to 27% less design power is needed in buildings situated in climate zone I compared to those in climate zone IV. The power for re-heating of the air supply unit is reported in the table and added to the total power needs in further calculations. Household hot water consumption is not included in the design power, as it is assumed that houses and buildings have water boilers that can be heated during off-peak conditions. The results are divided according to the four climate zone categories in Finland, and the design power is calculated separately for detached houses and apartment buildings. The outside temperature limit for the design is according to the National Building Code of Finland (2012). Class definition: A = House or apartment building built before 1960. Ventilation: natural ventilation, air exchange rate 0.4 l/h. Heat distribution system: water radiators 70/40°C. B = Thermal insulation according the minimum requirement of the National building code of Finland (2010). Ventilation: mechanical supply and exhaust with heat recovery, air exchange rate 0.5 l/h. Temperature ratio of supplied air is 0.6. Air tightness rate (n50) in detached house 2.0 l/h and apartment building 0.7 l/h. Heat distribution system in detached house by hydronic floor heating (design temperatures 40°C/30°C), in apartment building hydronic radiators (design temperatures 70°C/40°C). C = Ultra-low energy building. Ventilation: mechanical supply and exhaust with heat recovery, air exchange rate 0.5 l/h. Temperature ratio of supplied air is 0.85. Air tightness rate (n50) in detached house 0.6 l/h and apartment building 0.6 l/h. Heat distribution system in detached house by hydronic floor heating (design temperatures 40°C/30°C), in apartment building hydronic radiators (design temperatures 70°C/40°C). Design power simulations were carried out for residential buildings only, as in industrial buildings, the energy demands vary significantly and no suitable averages exist for describing their energy use. However, industrial areas are included in the surface area calculations in our article (Table 4). Therefore, calculations for industrial buildings are theoretical but are used to illustrate the potential for groundwater energy utilisation. The table shows the 20 areas with the greatest groundwater power adequacy as well as the areas ranked 100th, 200th, 300th, 400th, and 500th. *Denotes a point-sized groundwater area. Building classification is according to Table 3, and the climate zone according to Figure 3. According to our results, 59,880 kW of heat load (H) could be utilised from Finnish aquifers that are zoned for urban or industrial land use. The H value describes the heating power that can be distributed to buildings from the groundwater heating potential (amount of heat, G) using heat pumps. Knowing the design power (W/m2) and heat load (W), it is possible to calculate the heating area of buildings. The heat load (H) results for aquifers showed a similar distribution of magnitude to the amount of heat (G), because heat load calculations are based on a constant COP of 3.5. The COP value is highly dependent on evaporation and condensation temperature differences in a heat pump. Therefore, the groundwater temperature will affect the COP value. In Table 4, aquifers are ranked according to their ability to heat buildings, which, because of the design power, is location dependent. Hence, an aquifer's ranking number in Table 4 may differ from that in Table 2. The only scientifically reported Finnish GWHP system, that utilising the Vieremä aquifer in the municipality of Forssa, employed 0.5-MW heat pumps (Iihola et al. ; Iihola and Laitinen ). According to our database, a heat load of 621 kW could be utilised from the Vieremä aquifer. Hence, our theoretical heat load calculations showed a high degree of comparability with practical experience in the Vieremä aquifer. We also ranked Vieremä aquifer in the 10th place in Finland in terms of its potential for heat energy utilisation. With the power of 59,880 kW, approximately 580,000 m2 of houses in category A, almost 1.3 million m2 in category B and almost 1.73 million m2 of category C houses could be heated (Table 5). The average volume of building permits for residential houses was 12.4 million m3 in 2011 to 2013 (Official Statistics of Finland ), and the minimum room height is 250 cm in Finland (National Building Code of Finland ). Hence, we can estimate that 25% to 40% of annually constructed residential buildings could be heated utilising groundwater energy. In Table 5, building category A corresponds to buildings built before 1960, for which, depending on the climate zone, the design power of houses is 97 to 121 W/m2 and that of apartments is 65 to 82 W/m2. Category B represents standard buildings with thermal insulation built according to the National Building Code D3. The design power of category B houses is 43 to 56 W/m2 and that of apartments is 28 to 37 W/m2. Category C represents modern ultra-low energy buildings, for which the design power of houses is 32 to 43 W/m2 and that of apartments is 22 to 30 W/m2. The total is a summary of 801 groundwater areas. The average heating area of category B houses is 1,380 m2 and that of apartments is 2,097 m2 (Figure 6). The median and maximum values are approximately 2.2 to 2.3 times greater in category B buildings than those in category A, and 2.8 to 3.0 times greater in category C than those in category A (Figures 6 and 7). The ability to heat varies significantly between the largest aquifers. The 90th percentile equals the 95th to the 97th most potential aquifers. Hence, a box plot diagram for the top 100 aquifers is presented in Figure 7. The design power values used for house and apartment classes for each climate zone are presented below the results. Distribution of the heating area calculations (all aquifers). The box indicates the 25th and 75th percentile and median. Whiskers indicate the 10th percentile (lower) and 90th percentile (upper). The mean value is also presented. Distribution of the heating area calculations (the 100 most potential aquifers). The box indicates the 25th and 75th percentile and median. Whiskers indicate the 10th percentile (lower) and 90th percentile (upper). The mean and maximum values are also presented. There are several hundred sites where GWHP could provide an additional solution for energy utilisation in Finland. Assuming that 100% of the heat is produced by a GWHP, 368 aquifers would provide the possibility to heat over 1,000 m2 of class C detached houses. Similarly, 365 aquifers could provide heat for class C apartment buildings with a surface area of over 1,500 m2. In most cases, thermogeological heating systems are not cost effective if they are designed to supply the maximum heat demand. The most effective solution, both environmentally and economically, is to design a heat pump system to fulfil 50% to 60% of the peak heat demand (Holopainen et al. ; Rosen et al. ). Considering this, our results are conservative, but indicate the potential to utilise renewable energy. Using Equation 7, applying the parameters (ΔT, COP, and SVCwats) used in this research and making a highly theoretical estimation that all replenished groundwater from Finnish categorised aquifers (5.4 million m3/day, The Hertta Database (), corresponds to the F value) could be pumped through a heat pump, almost 1,200 MW of heat load (H) could be produced by using GWHP systems. This amount of power could be used to heat over 20 million m2 of housing and is approximately 70% of the net power produced by both OL1 and OL2 nuclear reactors of the Olkiluoto nuclear power station in Western Finland (Ministry of Employment and the Economy ). The methodology we present this paper could easily be implemented in other countries or states to investigate the large-scale geothermal potential of aquifers. This methodology and the results could also be used as a preliminary mapping tool to identify the aquifers with the greatest potential for energy utilisation in a particular region. However, the reliability of the results is dependent on accurate estimation of hydrogeological and land use information. Groundwater can be a significant local source of renewable energy in Finland. Because GWHP systems are internationally recognised to utilise renewable energy, and groundwater is easily exploitable from shallow sedimentary aquifers, it is an attractive option for energy use and should also be recognised in Finland. Groundwater energy utilisation is dependent on the existence of geologically and geochemically suitable aquifers that are zoned for urban or industrial land use and are only located in certain parts of the country. Hence, groundwater energy cannot provide a nationwide source of heating energy in Finland. This article is focused on the heating perspective, but the discussion is equally valid for cooling applications. Approximately 56,500 ha of classified Finnish aquifers, comprising 801 groundwater areas, are under urban or industrial land use. According to the analysis presented here, the groundwater of these urban and industrial areas contains 40 to 45 MW of heating power. Assuming a COP of 3.5, 55 to 60 MW of heating power could be utilised from these aquifers using heat pumps. With this amount of power, almost 1.3 million m2 of standard detached housing and over 1.7 million m2 of modern ultra-low energy detached housing could be heated by GWHP systems. Because of the estimated groundwater flux we used, the results are conservative, and the amount of thermogeological energy that could be provided by groundwater may be higher than presented here. It is possible that the natural groundwater temperature may provide the limiting factor for a GWHP system rather than its flux, especially in northern parts of the country. Moreover, the geochemical composition of groundwater may limit the use of heat pumps in the coastal areas of Finland. More research is needed to determine the site-specific factors limiting GWHP systems, especially in northern Finland, and also in the diverse geographical, geological and geochemical regions in southern Finland. The limiting factors may include the sustainable yield of the aquifer, groundwater temperature and chemical composition. Further investigation is also needed to measure the influence of the urban heat island effect on groundwater energy utilisation in the northern region. Careful thermogeological and environmental research is needed when planning individual GWHP systems. Hence, the information presented in this paper is indicative, and should not be used when planning heating and/or cooling systems for a single property. We thank the following persons for their support and advice: Juha Jokisalo, D.Sc., Professor Veli-Pekka Salonen, Dr. Martin Preene, Mikko Hynninen, M.Sc. Tech., Petri Siiro, M.Sc., Esko Nylander, M.Sc., Janne Mäkinen, M.Sc. and Dr. Roy Siddall for language revision. Special thanks to colleagues in the Turku office of Golder Associates. This research was funded by Golder Associates Oy, the foundation Maa-ja vesitekniikan tuki ry and the K.H. Renlund Foundation. TA is the corresponding author, who planned the research, selected the co-authors, performed groundwater energy calculations for the groundwater energy database and wrote most part of the text. LE measured the design power by performing an IDA-ICE 4.1 simulation, prepared Table 3 and provided instructions for the heat pump equations in the methods section. JH performed ArcGis-related work and prepared Figure 4. KKN wrote a part of the ‘Thermogeological environment in Finland’ section and participated in the design of this study. She also supervised the planning of the research. All authors read and approved the final manuscript.